Have you ever been in a car and you see another automobile turn the wrong way down a one-way? They are in danger without realizing it, so what do you do? You flash your lights, honk your horn, and yell at them to try to get their attention, right? 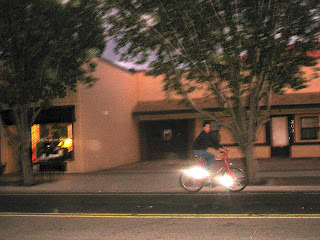 Well, that's what I did to this guy who I saw early Friday morning flying down Union the wrong way in the bicycle lane. He didn't seem to get it. He just looked at me and smiled while I yelled "you're going the wrong way, you're going to die". Why do most Puebloans think you're suppose to ride against traffic? This is one of my huge pet peeves. A bike lane is like a vehicle lane: go the direction of traffic. Argh! And I hate when bikes don't stop at red lights. There. I've vented, too.